Hudson is doing so well today especially with his increase in fluids. 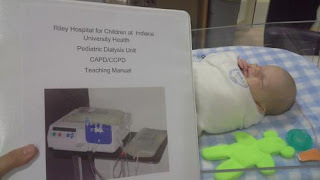 He is at 39 mL of breastmilk every 3 hours and 90 mL of dialysis every hour. Today he weighs 7 lbs. 4 oz and the doctors think he should now start gaining weight. Today, I had two really good nursing sessions with Hudson both 15 minutes long and I loved every minute of it staring at his sweet face and holding his fingers while he nursed. Tomorrow they plan to add some calories and protein to his feedings and it sounds like tomorrow would be a good day for dad to introduce a bottle. Once he gets bottles and nursing down perfectly then the feeding tube and picc line can come out. We can't wait for that day!